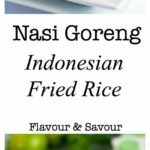 Make Nasi Goreng (Indonesian Fried Rice) when you have leftover rice! Add shrimp, chicken or make it a vegetarian meal and toss in some fresh vegetables instead. Nasi Goreng is simply fried rice. It’s considered the national dish of Indonesia. 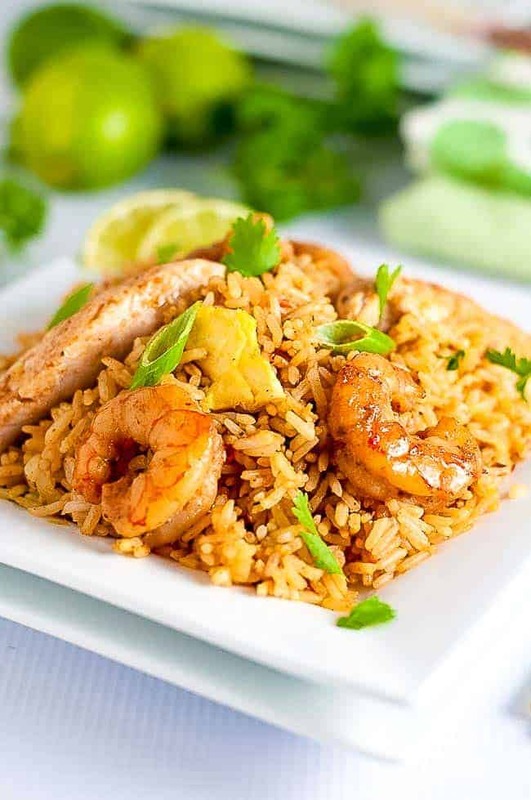 In a country where nothing is wasted, leftover rice from the previous day’s dinner is often turned into this flavourful dish the following day. 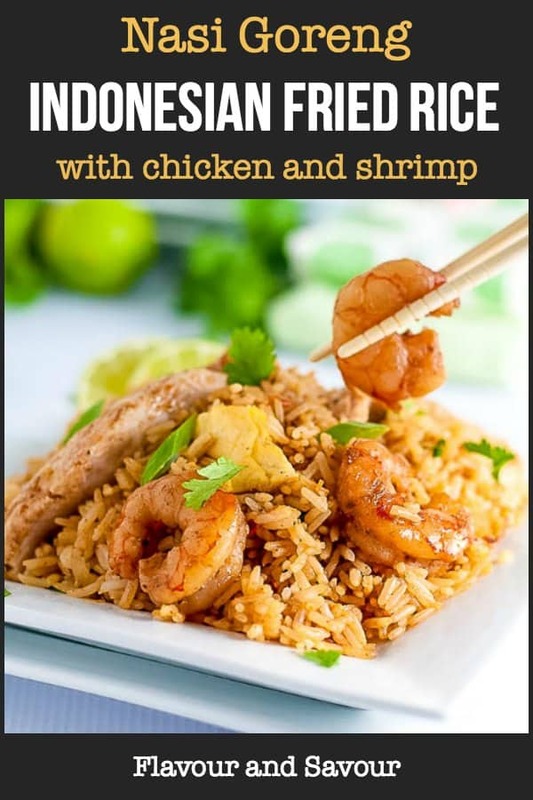 It’s mixed with seasonings, freshly caught prawns or shrimp and chicken, and then garnished with cooked egg, green onions, and cilantro. It’s fragrantly spiced comfort food that is easy to make at home. There are lots of different variations of this dish, depending on the region and available ingredients. This one is mine. It’s easy to adapt to your own tastes and make it yours! You’ll love this 30-minute meal! Jasmine rice: leftover is best. Cook it the day before and chill it overnight. Rice cooked the previous day has a better texture for fried rice, as freshly cooked rice is too moist and soft. 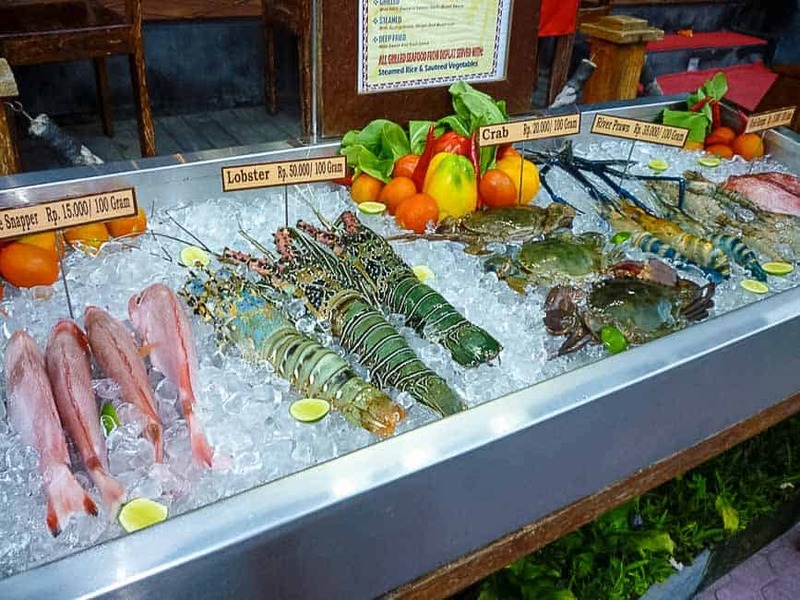 In a Southeast Asian climate of intense heat and high humidity, labouring in a hot kitchen would be unbearable. This dish is cooked very quickly over high heat. It is often served with prawn crackers. Nasi Goreng, or Indonesian Fried Rice, was our favourite dish when we traveled in Bali in Indonesia. 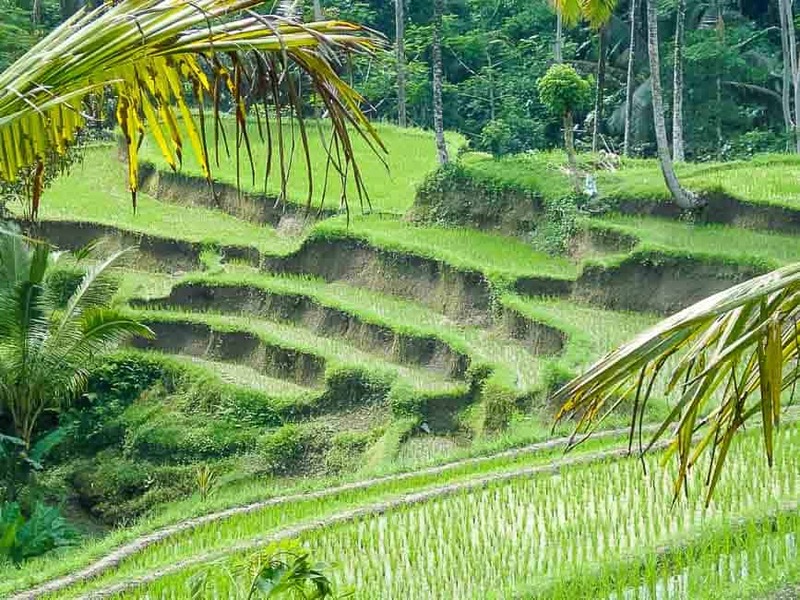 If you’ve been to Bali, you probably ate it there, too! It is available anywhere, anytime, for breakfast, lunch or dinner. It’s served in high-end restaurants, in small cafés, or by street vendors. Later in our trip, we became more adventurous in trying different dishes, but at the beginning, my sensitive stomach told me to play it safe. I chose it from menus because it was one of the few things that was familiar to me. I knew it had been cooked over a high heat that would kill anything my sensitive Canadian digestive system wasn’t used to. 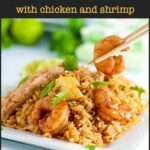 This Indonesian Fried Rice dish comes together quickly. Cook the rice at least 2 hours in advance, preferably the night before. Spread it out to cool and refrigerate if storing overnight. Make two small omelets by whisking together eggs with sesame oil and salt. Set aside, as you’ll use these as garnish to top the finished dish. Next, sauté shallots, ginger, garlic and pepper. Add the chicken and/or shrimp and stir-fry for a few minutes or until chicken is no longer pink inside. Add the cooked shrimp and stir fry for a few minutes. Next, add the seasonings: Samabal Oelek, fish sauce and ketjap manis. Stir until well combined. Turn out on to a large platter and garnish with strips of omelet, green onions and cilantro leaves. Fish sauce is a fermented product made from fish (often anchovies) and salt. All are usually available in the International food section of your supermarket. This Nasi Goreng is even better the second day! The rice absorbs all those wonderful Indonesian seasonings. Store leftovers in an airtight container in the refrigerator and gently reheat the following day. 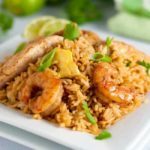 Enjoy this 30-minute meal! 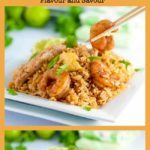 Make this quick Indonesian Fried Rice (Nasi Goreng) when you have leftover rice! Add shrimp, chicken or make it a vegetarian meal and toss in some fresh vegetables instead. Boil rice in water or broth or water-broth combination until cooked. Rinse, drain and spread out on a baking sheet to cool. 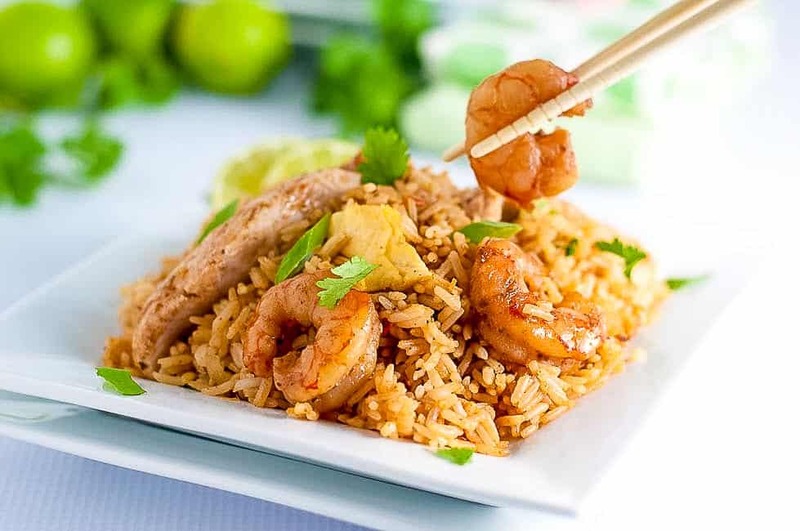 Prepare the rice at least 2 hours ahead, or preferably the day before, chilling in the refrigerator overnight. Whisk eggs with sesame oil and salt in a small bowl. In a small skillet, make 2 thin omelettes and cut into strips. Set aside. Heat a wok or large skillet over medium-high heat. Add the grapeseed oil and heat until it ripples. Add the shallot, ginger, garlic, and pepper and stir-fry for 2 minutes. Then add the chicken and shrimp and stir-fry for a further 2-3 minutes or until chicken is no longer pink. Add the cooked rice and continue to stir-fry for 3 minutes. Stir in the sambal oelek, oyster or fish sauce and ketjap manis and continue to heat, stirring for 2 minutes. Turn onto large serving platter and garnish with the omelette strips, green onions and fresh cilantro. Serve hot. This recipe was originally published in 2017. I’ve updated it with new information. We like Nasi Goreng and Loreto often makes it at home (without chicken for me). Yours look beautiful and delicious. 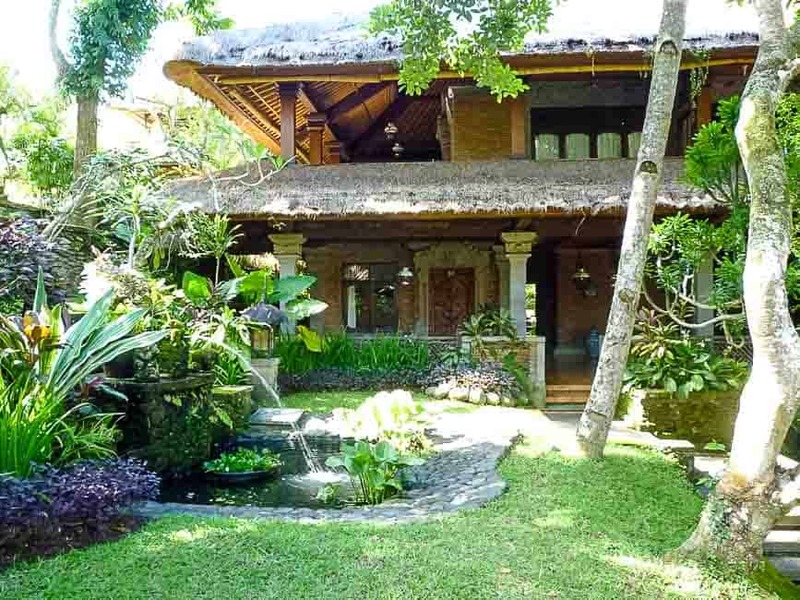 It must have been amazing to eat it right there, in Bali! What a wonderful trip! Thanks Nicoletta! Yes, this is a really versatile dish—you can add in extra vegetables, or leave out the meat! I always wanted to try this recipe – even bought the Katsup Manis! Yum! I love all the flavours from that part of the world. 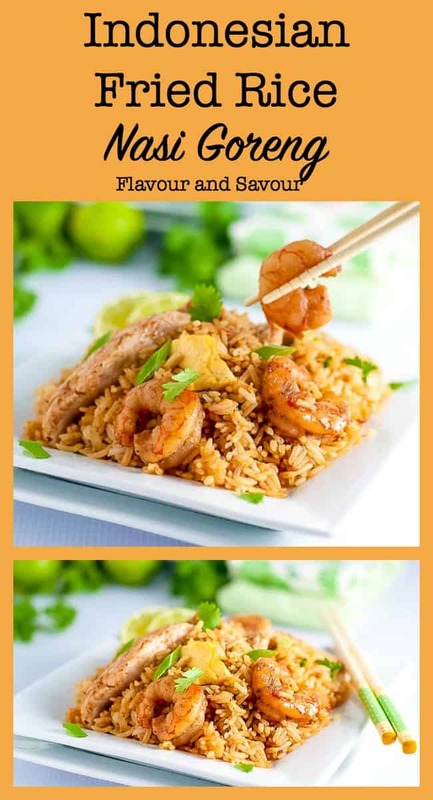 Your nasi goreng look delicious! It’s one of my favourite rice dishes. And your version looks delicious! Yum! Your trip must have been exciting! It’s nice to have the chance to try different foods in other countries, as sometimes the versions we get at restaurants here in Canada just aren’t quite the same. I’ve only ever had nasi goreng in restaurants, but I’ve been meaning to try making it at home. Thanks for sharing! Yes, I love trying different foods when I travel. I think you can learn a lot about a country and its culture through its food! well, I just found my next shrimp dinner! Sounds amazing and packed with flavor. Thanks Inci! It’s an easy dish to make too.